The popular BBC1 talent show All Together Now returns to Saturday nights this Saturday March 2 at 7.30pm. Introduced by comedian Rob Beckett and with a £50,000 cash prize for the winner, viewers may recognise a familiar face on the second row amongst ‘The 100’ judges. Bath music man, choir leader and founder of the Goldies Charity and Goldies Cymru, Grenville Jones, will feature in all the programmes from the BBC studios in Salford Manchester this series. Grenville was a judge last year but because of his work commitments could not do all of the shows. With former Spice Girl Geri Horner as chief judge The 100 are drawn from across the music industry. From the acts each week they choose the top two who then go through to the final and the chance to perform for the £50,000 prize. Last year’s winner Michael Rice will be the UK’s Eurovision representative in Tel Aviv this May. Grenville is pictured with show host Rob Beckett. One of the UK’s best-loved choirs will perform at St Peter’s Church, Ruthin, on Saturday evening March 23. Bath Male Choir achieved national acclaim when they reached the finals of the BBC1 series ‘Last Choir Standing’. Since that time they have travelled around the world including a memorable tour to Japan. In November this year they will be visiting Boston, Massachusetts. The founder of the choir is Grenville Jones who has a national reputation as a choir leader but also as the founder of the Golden-Oldies Charity. Grenville started ‘Goldies’, as it is more fondly known, back in 2007 and it now reaches across England and Wales with its popular fun daytime Sing & Smile sessions. Grenville is always quick to point out that Goldies is NOT a choir, it is simply a chance for older folk to have the opportunity to get out, have a good sing-song and make new friends. Under the Goldies Cymru title the sessions are extending across Mid and South Wales and Grenville plans to bring Goldies Cymru to North Wales in the next two years. As part of the day at Ruthin Grenville will lead a ‘come and sing’ workshop from 3.00pm-5.00pm. The accent will be on easy to sing melodies and the workshop choir will perform as part of the evening concert. Tickets are priced : Workshop and Concert £5 or Evening Concert only £8 and can be purchased from the Church office on 01824 707820 or 01824 705755. Picture shows Grenville with Katherine Jenkins receiving an award for his Goldies charity as winners of the National Lottery Awards 2018, Education Category. They wowed BBC Saturday night audiences on ‘All Together Now’ and on Saturday evening June 2 The Sundaes singing group will be top the bill in a variety show at The Forum, Bath. The Sundaes are, quite simply, the ‘biggest’ girl group in town! With stunning vocals, sensational choreography and those flamboyant costumes. Bath’s own Grenville Jones was one of the ‘100’ judges for the popular Saturday night BBC ‘All Together Now’, which was screened earlier this year. “The Sundaes sang through to the final of the show and as soon as I saw them on stage at the BBC in Manchester I knew that I had to book them to sing at a show in Bath. ” said Grenville. Tickets are on sale priced £20 for the variety show at The Forum now from Bath Box Office on 01225 463362 and the evening is packed with personalities and performances. Grenville’s own celebrated Bath Male Choir will be singing. They hit the headlines on the BBC’s ‘Last Choir Standing’ and have since sung across Europe with a tour to Japan three years ago and a reputation for standing ovations..
Apart from Grenville’s many choirs he is the founder of the Golden-Oldies Charity which now has spread across the whole of England and Wales with its 150 FUN daytime singing for older isolated people. A Grenville initiative was to introduce an intergenerational project with his charity and schools. This year the focus is on the final months of WW1 with a project supported by Heritage Lottery, the Royal British Legion and others. 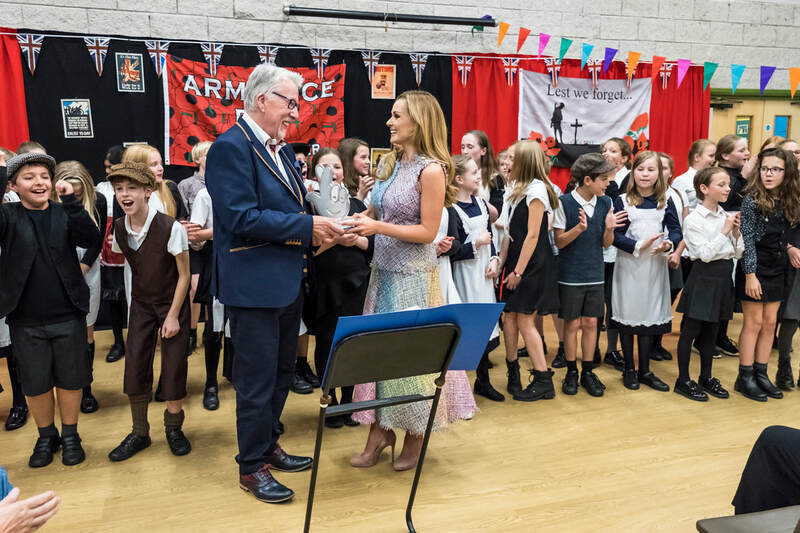 The first half of his show on June 2 will be a poignant performance by young people from the Curtain-Up Theatre Group of a production entitled Armistice Cantata, a unique new focus on the end of WW1 written by children for young people to perform. There will also be community singing for all with those well-loved songs of 100 years ago; ‘Pack Up Your Troubles’, ‘Tipperary’ and much more. “Tickets priced £20 from Bath Box Office for a really special evening,” says Grenville. If you watched the new BBC1 show All Together Now last Saturday evening at 7.15pm you may have seen a familiar face amongst the judges. Bath’s own Mr Music, Grenville Jones, is one of the panel called, ‘The 100’ who choose the winners each week to go forward to sing for a massive £50,000 prize in the sing-off final show on March 3. Dubbed by the BBC as, ‘A singing show with a difference’, 10 acts perform each week for the 100 judges sat in front of them, which includes former Spice-Girl Geri Horner. Two winners each week go through to the final show. Stand-up comedian Rob Beckett presents the show which comes from the BBC studios in Manchester. The 100 judges come from across the UK and represent all genres of music. Grenville’s reputation as a choir leader led to his invitation to be part of the exclusive group. He is also the founder of the Golden-Oldies Charity whose fun formula of daytime sing-alongs for older isolated people now reaches across England and Wales. Grenville’s list of choirs now numbers 14 which include the famous ‘Last Choir Standing’ Bath Male Choir. He is also the author of the popular choir novel Deep Harmony which has just been re-published with the addition of a final chapter answering the cliffhanger question – what happened next?